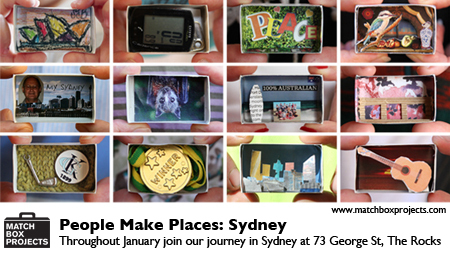 Over the coming weeks we will be collecting Sydney matchboxes and conducting artist talks introducing some of the 2000 matchbox impressions we have collected from 10 diverse global regions People Make Places has been created in so far. We will be in and out of the Rocks daily/nightly - call us on 0410 331 600 or 0419 388 108 to make a time to meet up. This entry was posted on Tuesday, January 6th, 2015 at 9:35 am	and is filed under Our Blog. You can follow any responses to this entry through the RSS 2.0 feed. You can leave a response, or trackback from your own site.